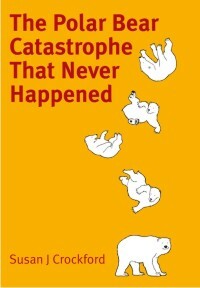 UPDATE FEBRUARY 19, 2014 – The misleading “State of the Polar Bear” graphic is now GONE (as of January 31, 2014). A new 2013 status table is offered by the PBSG here. 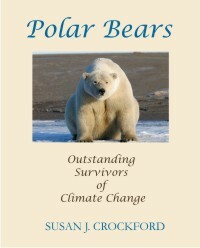 It has detailed text explanations and harvest information, with references, hyperlinked to each subpopulation entry (“Press the subpopulation hyperlink and more information will appear“) and may have replaced the “State of the Polar Bear” graphic that the PBSG commissioned for upwards of US$50,000, although the PBSG website says it is being “updated” [A pdf copy of the 2013 colour table is here, and my commentary on it is here.] I have left the original post as is, below. Two days ago, I got a short note from PBSG chairman and website manager Dag Vongraven of the Norwegian Polar Institute, Tromso. He was responding to an email I sent him earlier this week asking about the apparent increase in global polar bear numbers when tallied by nation as depicted in the “State of the Polar Bear” dynamic “tool” featured on the Polar Bear Specialist Group (PBSG) website, which I discussed in a previous post here. The tally by nation in that PBSG document suggests that the world population estimate for polar bears is 22,600-32,000 – far higher than the 20,000-25,000 “official” estimate. Apparently, this tool was developed by a US-based web company under Vongraven’s supervision. But, he says, he has “not yet had time to review all details in it as well as I should.” So, without a careful final review, the document was posted on the front page of the PBSG website, where it has been featured for several months. The “tool” consists of three maps – that’s it. They are titled Subpopulations, Nations, and Ecoregions. I previously discussed the population totals by Nation, but when I went back and looked at the Subpopulation numbers, I realized they are very odd as well. The total population estimate listed on the Subpopulation map add up to just 13,036 – not even close to the 20,000-25,000 “official” estimate. The map (see screen cap below) gives no number (estimate = 0) for the following subpopulations, all of which have an official estimate (see previous post here, estimates from the 2009 PBSG report in square brackets): Foxe Basin [2,197], Viscount Melville , Laptev Sea [800-12,00] and Barents Sea [2,650]. On the map below, all of the regions coloured grey have no estimate provided (estimate = 0). In addition, there is no estimate provided for the Chukchi Sea subpopulation, coloured orange in this map, as per the official estimate [you can’t see the numbers given in this screen cap because they only show up when you hover your mouse over the region]. So when you add up the individual estimates provided on each of the two maps on this web tool, you get two different numbers that have no resemblance to the “official” estimate of 20,000-25,000. 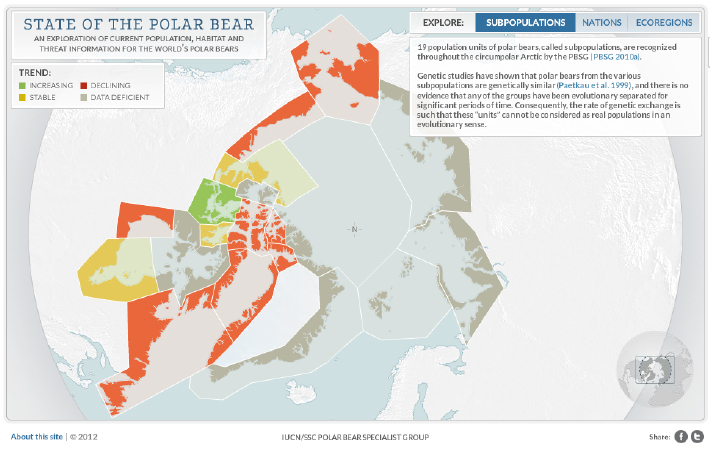 “Subpopulation” status map, from the Polar Bear Specialist Group dynamic web tool, “The State of the Polar Bear.” [downloaded January 17, 2013]. Population estimates for each region show up on the original web-based tool when you hover your mouse over the map. All of the regions coloured grey, as well as one of the orange-coloured regions (Chukchi Sea, centre top), do not have a number provided. Vongraven says he is recovering from surgery and so it may be awhile until someone takes a look to see what’s up with this tool. He did not seem overly concerned about it. But he assured me that the official polar bear estimate of 20,000-25,000 has not changed, although it may after the next population review at the PBSG meeting later this year. 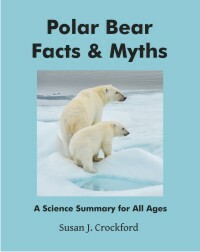 The point is this: if you were a high school student or a teacher looking for a simple and authoritative summary on the status of the polar bear, this tool would look very attractive. The IUCN/SSC Polar Bear Specialist Group want us to consider them the ‘premiere’ experts on polar bear numbers worldwide but these maps do not accurately summarize the current state of knowledge about global polar bear population numbers. The maps are misleading and confusing. We may never know who’s bright idea this was but I in my opinion, it’s a dud.